The near-collapse of Equitable Life shocked not just the firm's policy holders, but the whole life insurance industry. Now the report of Lord Penrose has laid open what went wrong. Equitable Life was promising its policyholders more money than it actually had for more than a decade, according to one of the most striking findings in the Penrose report. For years, Equitable had claimed to be more transparent than other life insurers, allowing its customers to work out what the value of a policy was in pounds and pence. But from the late 1980s, the society was telling policyholders their investments were worth substantially more than Equitable actually had in its coffers. By the year 2000, the stated value of its customers' policies was £3bn more than the assets actually held by the company. That was before the House of Lords handed Equitable a bill of more than £1.5bn to pay for annuity guarantees in full. By 2001, that gap had reached £4.4bn - forcing the new board led by Vanni Treves and Charles Thompson to slash policy values by 16%. It was that policy of consistently allocating to policyholders more than it actually held in assets which led to the society's financial troubles. Annuity guarantees only precipitated its decision to sell itself. The society did not believe in keeping money from current investors in order to build up a reserve for the future. From one perspective, there would be nothing wrong with Equitable allocating more to policyholders than it had in its coffers - for a short time. In "with-profits" funds life insurers hold some money back in reserve during years when their investments on the stock market do well. That way they can still afford to make good payouts in years when their investments do poorly - an approach known as "smoothing". Because of smoothing, a life insurer may at times allocate more value (in the form of bonuses) to its customers policies than it holds in underlying assets. However, that should, in theory, be a temporary state of affairs. When markets are booming, the value of the underlying assets should exceed the value allocated to policyholders. Another way of looking at this is the "peaks and troughs" diagrams adopted by sales people. These show the effect of smoothing: although in the good years the investor may not do as well as he would in a fund that tracked the stock market, in the bad years the investor should do better, "smoothing" out returns - steering a middle course between the peaks and troughs. Equitable's appointed actuary in the 1990s, Chris Headdon, told Lord Penrose Equitable was "smoothing across the peaks" - not a credible approach, according to the judge. Equitable explicitly adopted a controversial policy, known as "maximum distribution". Its chief executive from 1992 to 1997, Roy Ranson, said this was based on a belief that the society belonged to the current generation of policyholders - not future generations. The society did not believe in keeping money from current investors in order to build up a reserve for the future. Because the maximum money was distributed to policyholders in good years, very little was held back for a rainy day. In theory, this should have meant that in bad years, the stated value of customers policies would go down. However, instead of cutting them, Equitable used a range of devices to keep them up - allowing a growing gap to open up between what it was promising policyholders and what it could actually deliver. One device - used by all life insurers to varying degrees - was to stop allocating bonuses to customers policies in the form of "reversionary bonuses". These were guaranteed and had to be counted on the life insurers' accounts as a liability. Instead, an increasingly large chunk of the bonuses allocated to policyholders took the shape of "terminal" or "final" bonuses. These could be added or cut with impunity and without affecting the company's solvency - even if they did affect the value the customer expected. Equitable never even counted part of these final bonuses as a liability. These included devices such as counting future profits - which might never be generated - as an asset in the accounts. Another was to use financial reinsurance to get a liability off its balance sheet. In fact the reinsurance provided only a very limited amount of cover. And the report yields yet more startling findings. The Government Actuary's Department (GAD) is supposed to monitor life insurance companies through the voluminous "returns submitted" every year by every life insurer. "It is clear that Equitable's returns were not understood by GAD actuaries throughout the 1990s," Lord Penrose writes (p 744 para 75). The board of non-executive directors were so dependent on input from executives, in particular the chief executive and appointed actuary, that they were "largely incapable of exercising any influence" (p. 739, para 51). Regulators (ie the Department of Trade and Industry and GAD) allowed Ranson to become chief executive and appointed actuary (normally separate roles to avoid conflicts of interest) in spite of the "obvious dangers inherent in such a concentration of authority and influence". Appointed actuaries have special statutory duties to look after the interests of policyholders and challenge management decisions if necessary. (Despite) "officials' clear understanding of the unsatisfactory aspects of the situation, no steps were taken effectively to prevent it coming about." 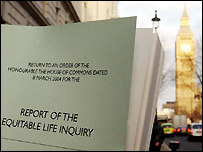 Roy Ranson, the "idiosyncratic and autocratic" actuary and later chief executive, formulated Equitable Life's policy on guaranteed annuities, ruled illegal by the House of Lords in July 2000, as far back as 1983. He did not tell the rest of the board about it until 1993. Policyholders were not told about it until 1995 at the earliest. Roy Ranson ran a large with-profits fund worth £30bn "without significant control by his colleagues, his board, the auditor or the regulator". There was an "unacceptable" lack of co-ordination between the two branches of regulation - the DTI, responsible for "prudential regulation" of the company's solvency - and other regulators (eg the Securities and Investments Board, later the FSA) checking on whether it followed strict rules on selling process (p 742 para 64). Regulators assumed no-one would be disadvantaged when Equitable continued selling policies after 1999, when it became clear Equitable might have a problem. Regulators simply assumed there would be compensation if something went wrong. There was no recognition that other policyholders would have to pay the compensation; no attempt to quantify the risks of Equitable continuing to do business; and no attempt to mitigate the possibility that policyholders might in future claim misrepresentation. In the words of Lord Penrose: There was a "general failure on the part of regulators and GAD to mount effective challenge of the management".